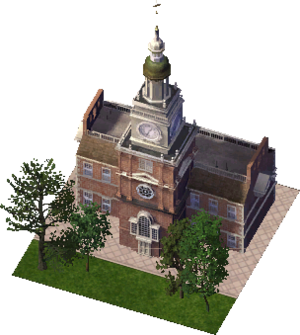 Independence Hall is a Landmark Building in SimCity 4. It provides no services aside from a Landmark Effect and Mayor Rating boost. It is a recreation of Independence Hall in Philadelpiha, completed in 1753. This page was last modified on 7 February 2014, at 06:49. This page has been accessed 4,393 times.